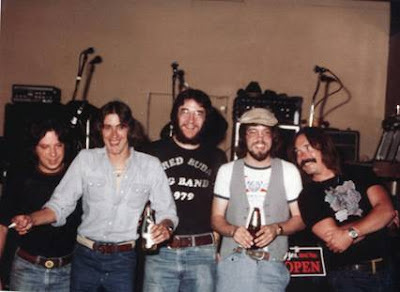 In the fall of 1979, an early version of a band that first called itself “The DB Cooper Band” played sporadically in Worcester Massachusetts as well as the Southbridge/ Brookfields area. 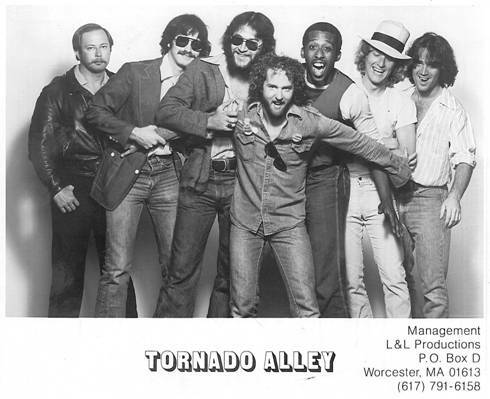 DB Cooper, as well as the very 1st version of Tornado Alley played their debut at The Blarney Stone, on Maywood Street in Worcester. The band consisted of John Freeman on bass, Dan Ahenger on guitar, Paul Bonnette on drums, Bill Gascoyne on tenor sax, and a large singer named “Dave” who’s last name escapes me. John Freeman was the driving force behind this band that he had essentially put together. This band eventually changed its name to “Tornado Alley” when they found out there was another DB Cooper band, threatening to sue for use of the name. Bassist John Freeman picked the name Tornado Alley. There had recently been a serious tornado in the Brookfields/Spencer area, and a boy scout had been killed at Treasure Valley camp in Spencer MA. Newscasts of the day kept referring to the area as “Tornado Alley”. In December of 1979, John Freeman, also the bass player for Worcester’s top country band SOUTHPAW was looking for greener pastures, and ran an ad stating “Wanted: Musicians for R&B based band.” Jazz saxophonist Steve LeClaire answered the ad, and the rest as they say is history. (Bill Gascoyne remembers the formation stemming from Steve and Bill playing together in a jazz/fusion group called "At Odd's End" which practiced in Steve's garage and had approximately one gig. The band rehearsed during the winter of 1980, and made its debut as TORNADO ALLEY at the Blue Plate in Holden MA in the spring of 1980. This band modeled itself after the Blues Brothers, who were popular on the heels of their hit movie and album. The cover repertoire consisted of old blues tunes, shuffles and “soul” music. In June of 1980, Southpaw had a change of personnel (a violent fistfight amongst the band, onstage at Sir Morgan’s Cove in Worcester that severely bloodied the guitarist and bass player – or the other guys, depending on who’s side you took) and John Freeman was asked to rejoin the band to cover a full summer of already booked dates. Freeman rejoined, but with the condition that he could take along the sax players LeClaire and Gascoyne. Here, these three met newly added guitarist Doug Moore, of Paxton MA, who was replacing guitarist Mark Emerick. Along with Freeman, LeClaire and Moore, this formation of the band made its debut at Sir Morgan’s Cove, in Worcester MA in February of 1981. This band started to gain a following in the Worcester county area, and began to work regularly. 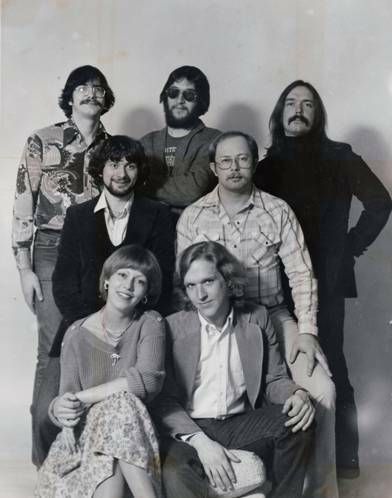 In February of 1981, Ben Gould of Northbridge MA replaced Reidy on trombone, who left to pursue a career in real estate and in March of 1981, Mike Mischitelli of Holden MA replaced Kovacs on keyboards. Mischitelli had been an acquaintance of Moore. SPRING/SUMMER 1981: The band became a mainstay at the Blue Plate in Holden MA, and the Beef & Bourbon in Rutland MA, as well as Boston West in Barre MA, and Sir Morgan’s Cove in Worcester, MA, and the crowds continued to grow. The band played all covers at this point, mostly Blues Brothers, “blue eyed soul”, and some Springsteen material. However, many were “personalized” into their own Tornado Alley versions. 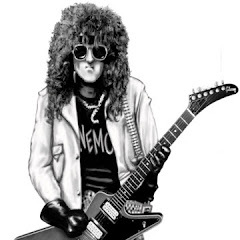 In August of 1981, bass player John Freeman married and left the band, moving to Florida. Through friendships with Mischitelli, the band met ex- American Standard Band drummer John Riley, just off the road with the Joe Cocker Band. Riley replaced Premo on drums. Through an ad, Bruce Reed replaced Freeman on bass, and took over the front man spot. This is the version of the band that most fans are familiar with, and really spotlights the high water mark of the band. Throughout the fall of 1981, the band used L&L Sound of Worceter MA for production and management. The band recorded a demo of Allan Toussaint’s “Fun Time”, Crow’s “Evil Woman” and Bruce Springsteen’s “Born To Run”, recorded at Larry Boria’s 8 track analog tape “L&L Sound Recording Studio”. “The Alley”, as the band was known in New England circles stayed strong with covers of Springsteen’s tunes, the Blues Brothers, as well as showing Riley’s Joe Cocker influence with many Cocker tunes. They became the quintessential “bar band” and good time partying dance band. SPRING of 1982 – the band adds saxophonist Rich Becker of Holden MA and plays with four horns in the section through the summer of 1982. The band also hired Bart McCracken & John Gallagher as full time crew, stage management and lighting. FEBRUARY 1983 – the band is desired by all Worcester clubs, and competition sets in. The band is packing houses wherever it plays. John Copolla of JC’s signs the band to a lucrative all exclusive contract that the band only plays JC’s in Worcester. MARCH 1983 – The band is on tour with a full schedule including Nantucket Island, Boston MA and Stowe VT. In April of 1984, keyboard player Mike Mischitelli decided to leave the band to work in his father’s restaurant. “Mitch” is replaced by former Albatross guitarist Jim Perry on keyboards, also doubling on guitar. At the same time, the band decided to replace Doug Moore with former Muddy Waters touring guitarist Mark Easton. The band cited creative differences with Moore over original material as the reason for his departure. By May of 1984, Jim Perry moves exclusively onto guitar, replacing Easton, and Eric North, ex Hometown Rockers is added on keyboards. The band continues to play at colleges and clubs throughout New England, opening for Clarence Clemons, NRBQ and others. The band returns to performing mainly cover versions of Soul and R&B standards. The raising of the drinking age finally took its toll on nightclubs in late 1984, and the high overhead of maintaining a huge stage show and road crew were cited in newspaper articles of the time as the reason for the final demise of Tornado Alley. The band had been working steadily into its 5th year, but individual players began to look for other options in the waning moments. Strong, original material by the band was elusive and never materialized, and The Alley’s strength remained in its live performances. Those shows became ritualistic “Rock & Soul” parties in the likes of Springsteen, James Brown, Sam Cooke and others, that the fans of Worcester and beyond will fondly remember. Tunes like Sam Cooke’s “Havin’ A Party”, Springsteen’s “Rosalita” and “Born To Run” are amongst the most remembered and requested songs. The last gig as TORNADO ALLEY was played at the old “Leicester Airport” on New Years eve 1985. NEMO Event: "The Bands of Jimmy D'Angelo"